Death by New River water – should have drunk beer, or maybe he did! On 15 January 1661 the Bills of Mortality reported the death of a man drowned at St John Clerkenwell. 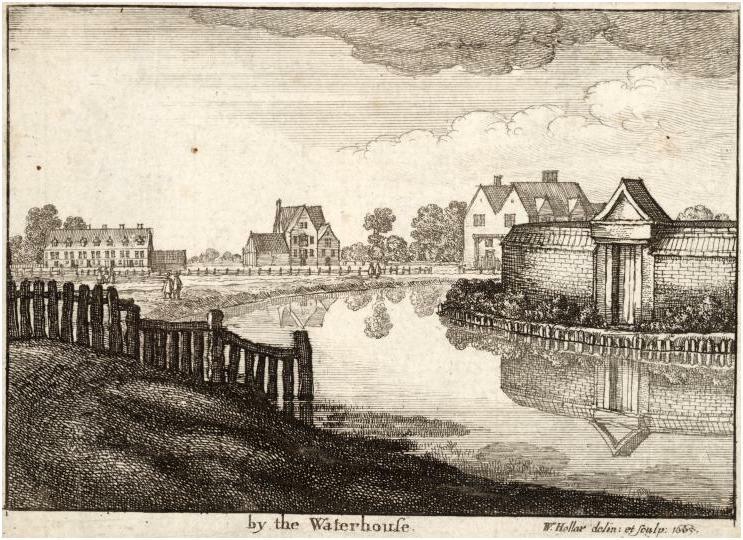 The parish burial register for that date provides a little more information noting that the man was a stranger and had drowned in the New River, or its reservoir, near to the Waterhouse in Islington (see Hollar’s excellent depiction below). It also notes that Mr Evans, the Middlesex coroner, called an inquest on the body and then granted a warrant for burial. While drowning was the most frequent form of sudden violent death in early modern London the majority of these deaths took place in the River Thames. London’s lesser watercourses and smaller land-locked bodies of water did however contribute to the general toll; in fact between 1655-1735 at least eighty-three people drowned in the New River. How this particular individual came to be in the water is not known but it seems that the inquest jury decided this was neither a case of murder nor suicide, so perhaps a drunken stumble into the cold clean water of the New River was all that was needed. For more info on the New River Company see http://en.wikipedia.org/wiki/New_River_(England). An engraving by Wenceslaus Hollar of the reservoir and Waterhouse of the New River Company in 1665 (just four years after the unknown man was drowned).